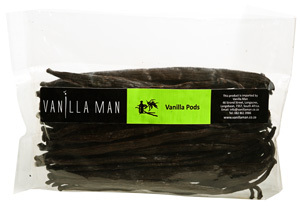 Vanilla Man vanilla pods is the seed of an orchid, and is dark brown to black when cured. When fresh, vanilla pods should be able to bend and twist without snapping. Vanilla Pods is a natural flavouring that can be used in both sweet and savoury dishes. Split the pod lengthwise and scrape the seeds out and into your dish. Best way to store vanilla pods is in an airtight container in the freezer, or in a glass jar at ambient temperature on kitchen cupboard out of direct sunlight. If stored in the freezer or a glass jar, vanilla pods should last for years. 265 flavours, all from mother nature. No preservatives, colorant or oils added.